Barkha herself grew up in the small town of Gujarat, India, thinking she did not have the same opportunities as boys. But, as she told an audience at a “Women In Tech” event to celebrate International Women’s Day, holding on to a dream is key to success. “I felt like I could not pursue my dreams of who I wanted to be. Don’t feel shy about your dreams. Explore the opportunities ahead of you and embrace the challenges you will face.” she said at the March 21 event co-hosted with our friends from Tabula Rasa. “Challenges are everywhere. It depends on how you take them,” Barkha said in explaining her own career evolution at Quadrant. 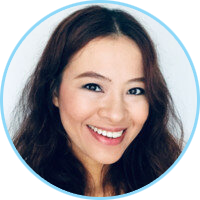 She progressed from working side-by-side with clients in data solutions to taking charge of a diverse team of data scientists, engineers and developers building a revolutionary blockchain-powered ecosystem that is changing how big data is transacted in the world. For Barkha, the key has been working with a team and managers guided by a corporate culture of respect and non-judgemental approach to gender and diversity. This is not just a fair approach for the employees, but also in the best interest of the business. “In a diverse environment, you tend to get more creative solutions and ideas. This could be anything from how to solve a particular tech problem to how to market and sell your solutions to customers,” said Barkha, who has also been interviewed on the issue. 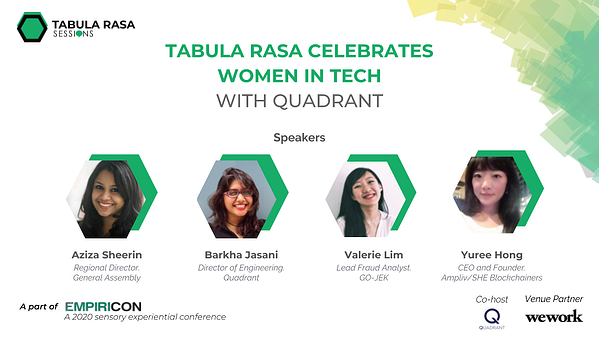 Barkha represented Quadrant in the discussion group with other women in leading tech roles in Singapore such as Aziza Sheerin, Director of the global tech education company General Assembly in Singapore; Valerie Lim, Lead Fraud Analyst at Go-Jek, and Yuree Hong, CEO of Ampliv/SHE Blockchainers. Moderated by Carrie Liauw, Founder and Director of Tabula Rasa, the event addressed how to inspire, help and support more women to choose careers in STEM (Science, Technology, Engineering, Mathematics) to boost the low female rates and pay gap in the field. The panel discussed the most common challenges women still face in technology and other male-dominated fields, from how to overcome confidence issues to dealing with the pressure of being the only woman in the room. They also explored how women can create opportunities for each other in the industry, from mentorships and more public and private forums to share experiences and support. Barkha believes patience, determination and an open mind to innovate and capitalise on diversity are the best ingredients for a both a successful career and successful business. At Quadrant we are always looking for people like Barkha, talented individuals with a passion for innovating in the big data industry in a diverse and multicultural environment. If you fit this description, or know somebody who does, CVs should be sent to (insert mail) and we will be in touch about suitable job openings. If you weren’t able to make it, don’t worry — we will be holding more events in the future. We hope to see you at upcoming events.